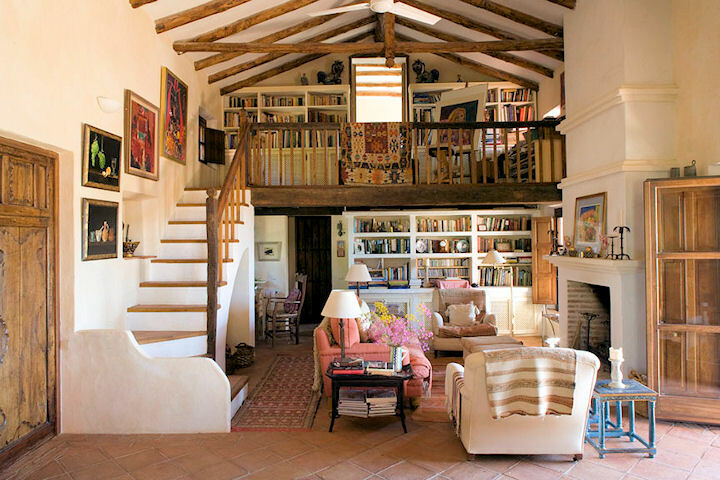 The main living room of this country house constructed in 2002 was designed by Sarah as her home to look like an authentic Spanish Cortijo or farmhouse. The double height room incorporates a Minstrels Gallery which is used as a painting studio and library. The supporting ceiling beams are varnished Spanish chestnut, milled locally, and the gallery's huge oak supporting beam and banisters sourced from a disused olive mill were made by a local craftsman joiner. The bookcase under the gallery was constructed by the builder from plastered masonry, with lattice wood doors below and those of the libary on the gallery entirely made of wood by a local carpenter. The antique panelled and carved oak doors were found by Sarah some years before and originate from Northern Spain. The furnishings are a mixture of family items with rugs and painted tables from Morocco, Turkey and India. The paintings are some of Sarah's own work and from her art collection. 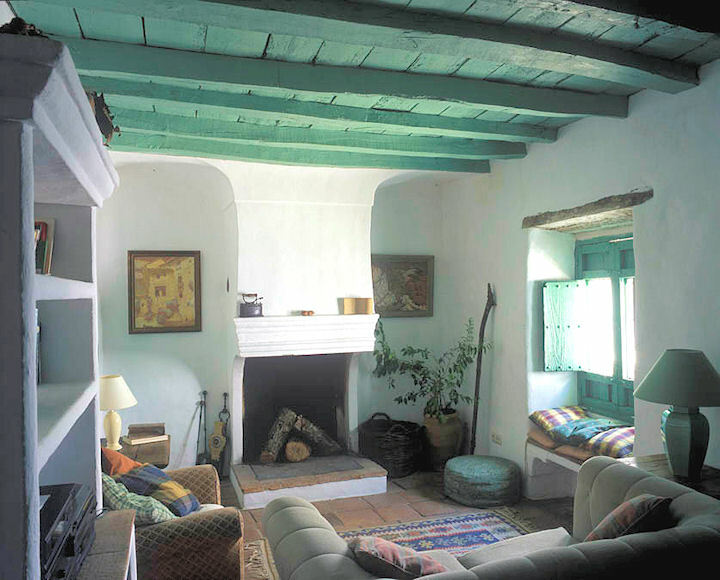 A typical fireplace created by Sarah from a traditional Andalucian design, with plaster mouldings which decorate the wide chimney breast. 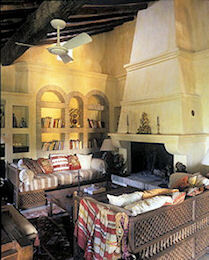 The cushions and cream throws were bought during one of Sarah’s many visits to Morocco and were made from local textiles and kelim rugs and the two poufs ,covered by her upholsterer, also with kelims and indian cotton. The white and black Berber rug came from the high Atlas mountains. Over the minstrels gallery railing hang antique kelims which are too delicate to lay on the floor, they are from one of Sarah’s buying trips to Istanbul. This winter sitting snug in the huge main space of a olive mill converted by Sarah in the Ronda mountains has a comfortable seating area in the area of the old grinding stone, and the original massive cast iron olive press, still in place, gives the room a special scuptural feature. The impressive fireplace was built to an old design with moulded chimney breast and bench seating either side. The unusual arched shelving, with concealed lighting, is made of local hand-made bricks in the Moorish 'Mudejar' style. 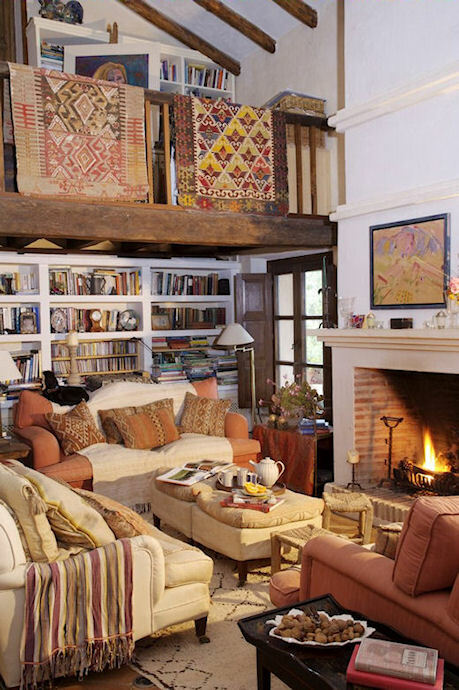 The walls are limewashed in yellow ochre, a traditional Andaluz colour, and the two sofas, specially commissioned and designed by Sarah, were made in Meknes, Morocco from individually carved ’moucharabi’ spindles. The cushions are also from Morocco and decorate the sofas which are draped with Turkish textiles to give a rich, soft look. The small sitting room is in a village house belonging formerly to the Miller whose Olive Mill was next door. The fireplace was totally rebuilt to Sarah’s design and her special fireplace formula was used internally, so that it worked perfectly and didn't smoke, but it was constructed exactly as it was externally and visually as the builder followed and recreated the exact moulding and proportions of the original mantelpiece. The panelled window, with studded, internal shutters was restored and painted the same green as the original beamed and planked ceiling, and a window seat built beneath it to create a cosy sitting area. 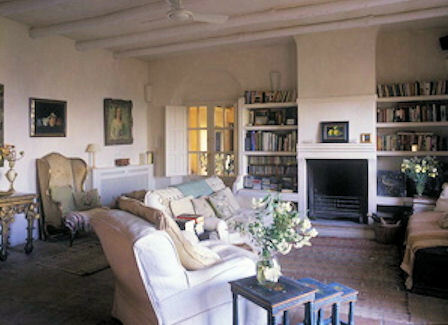 This living room was created by Sarah and built above an old village olive mill 10 years ago using local hand made terracotta floor tiles, limewashed chestnut beams and walls and masonry plastered bookshelves either side of the fireplace. The arches over the window and door openings were taken from an old design. The furnishings are an elegant but comfortable mixture of Italian, French and Spanish antiques with Moroccan rugs and textiles. The oil still life paintings were specially commissioned and painted by Liz Bayer after the style of the Spanish Old Master painter, Zurburan.